Broken Spoke Bike Co-op | We’ve moved! We’ve now re-opened in our new premises in St Thomas School on Osney Lane, come on down and check it out! We’re still in the process of putting up shelves, unpacking boxes and hanging up tools, so we hope you bear with us while we’re working on opening up more and more of the space to you guys. Hopefully operation is going to be in full swing soon. Our opening hours have stayed the same (for now). 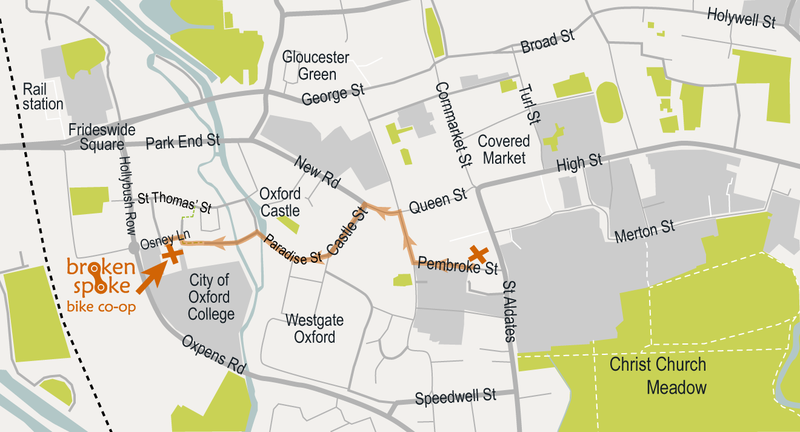 Our new premises is about an 8 minute walk from our old workshop, and it is close to Oxford Railway Station.